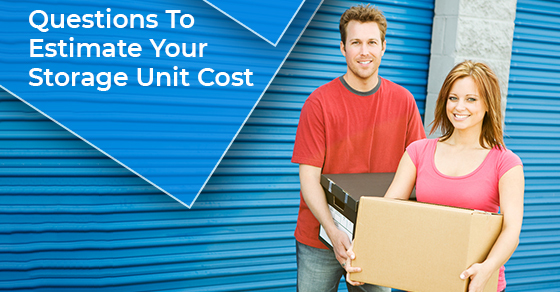 There are many reasons why you might rent a storage unit. You might be in the midst of downsizing to a smaller home, could be moving away for a while, or you could be hoping to get some of the clutter out of your home. Regardless of why you are thinking about renting a storage unit, you are probably wondering how much you can expect to pay for it. Of course, this varies based on a number of factors, but these are a few questions that you can ask to get a better idea of what your expenses will be. Where Will I Need to Rent a Storage Unit? First of all, you should consider the area where you’re renting a storage unit. Cities and towns with a higher cost of living might have higher rental fees. Additionally, storage units that are located in convenient areas of town might be more costly than those that are in more suburban or rural areas. How Big of a Unit Do I Need? Storage units come in a variety of different sizes. In most cases, the bigger the unit, the higher the price. Determining the size you will need will help you find a good starting point about how much you can expect to pay in rental fees. Some people choose climate-controlled units because they want to protect certain items — such as valuable artwork — from humid or cold conditions. Because of the additional cost of controlling these climates, the fees are generally higher for these units. For items that don’t need to be regulated, consider a traditional unit which is usually much cheaper. Some companies offer 24-hour access to the storage units, which might be something that you would prefer. After all, you may want to access your belongings without having to wait for regular business hours. You may have to pay more for a storage unit at a facility that offers this option, however. Will I Be Using Additional Storage Options? Many storage facilities offer more than just storage units. They might offer portable containers that can be used for moving your belongings, and they may offer garages for storing recreational vehicles, boats and cars. If you need these services in addition to your storage unit, you may be able to get a good deal at a storage facility. Of course, this will generally cost more than if you were just renting a storage unit alone. Do I Need Drive-Up Availability? If you are going to be moving heavy furniture or other large items into your unit, then you may need a drive-up unit that has close access to the front, that is on the first level and that has a garage-style overhead door. This can be much more convenient but may cost more than a unit that doesn’t have drive-up availability, such as a unit that might be on the second floor of the storage facility. Do I Need Extra Amenities Inside the Unit? Some storage units are bare-bones. Others have ample lighting, plenty of electrical outlets for plugging things in and more. If you look for a storage unit with these amenities, you might have to pay a little more for the convenience. However, you might find it to be worth it so that you can work more easily and stay more comfortable while you’re in your storage unit. How Secure are the Storage Unit Grounds? Of course, you are probably going to want to look for a secure facility for storing your belongings. Some facilities offer superior security, even though they might charge a little more than storage companies that don’t offer all of the security perks. Some of the more secure facilities have access control systems, surveillance cameras, security systems and even on-site security guards to help keep their customers and their customers’ belongings safe. Do I Need Extra Services? If you are going to need extra services, such as a mailbox rental that you can use for your business, then this can obviously impact your cost. For many people, such as those who want to use their storage unit for business purposes or who are going to be out of town for a while, having these services available can be very convenient. If you are unsure of what is out there, just ask someone from your rental facility. Someone there should be more than happy to tell you about the extra perks and services that are available. Many people are willing to prepay for their storage services. This is especially useful for those who know they need long-term storage. Some storage facilities offer a discount to customers who do this. For those looking to save some money and make things more convenient, this might be a good idea. On the other hand, if you would like to keep things more flexible or want to reduce how much you have to spend at one time, you may have to opt for a slightly more costly monthly storage rate. Even though this might come with a higher storage unit cost, it might be worth it to you. As you can see, there are a few questions that you can ask to help you determine how much you will have to pay for a storage unit. Of course, these costs vary, but by asking these questions and doing your research, you should be able to find an affordable price on a unit that will work well for your needs. For any questions about our costs, don’t hesitate to contact Jiffy Storage. Make the smart move today!